Cluster Manager: One (1) machine running Ubuntu 14 or 16 with at least 1GB of RAM for cluster manager, which will proxy TCP and HTTP traffic. Load Balancer: One (1) machine running Ubuntu, CentOS, RHEL, or Debian with at least 1GB of RAM for the Nginx load balancer and Twemproxy. This server is not necessary if you are using your own load-balancer and you use Redis Cluster on the Gluu Server installations. Gluu Server(s): At least two (2) machines running Ubuntu, CentOS, RHEL, or Debian for Gluu Servers. The Load Balancer is the only node that should be externally accessible through 80 and 443 from outside your cluster network. If you're behind a proxy you'll have to configure it inside the container/chroot as well. One of the configured repositories failed (Unknown), and yum doesn't have enough cached data to continue... etc. Could not retrieve mirrorlist http://mirrorlist.centos.org/?release=7&arch=x86_64&repo=updates&infra=stock error was 14: curl#7 - "Failed to connect to 2604:1580:fe02:2::10: Network is unreachable"
This will initiate a prompt to create a keypair. 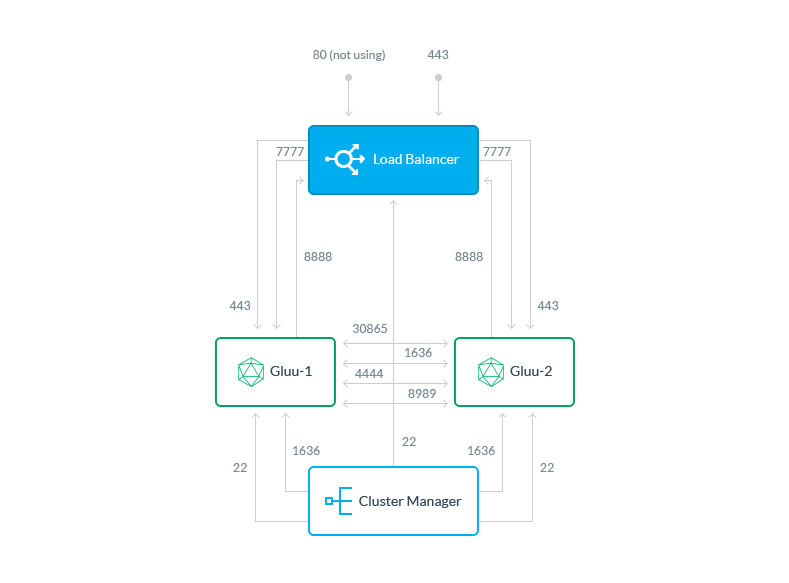 Cluster Manager must be able to open connections to the servers. Cluster Manager now works with encrypted keys and will prompt you for the password any time Cluster Manager is restarted. Copy the public key (default is id_rsa.pub) to the /root/.ssh/authorized_keys file of all servers in the cluster, including the NGINX server (unless another load-balancing service will be used). This MUST be the root authorized_keys. default-jre is for license requirements. It is not necessary if Java is already installed. There may be a few innocuous warnings, but this is normal. License files are not currently enforced, it's on the honor system! Please see the Gluu Support License to see if you're eligible to use Cluster Manager in production. In future versions, a license file may be required. All Cluster Manager commands need to be run as root. Automated key rotation can be configured inside the Cluster Manager UI. When Cluster Manager is run for the first time, it will prompt for creation of an admin username and password. This creates an authentication config file at $HOME/.clustermgr/auth.ini. We recommend using the oxd client software to leverage your Gluu Server(s) for authentication to Cluster Manager. After oxd has been installed and configured, default authentication can be disabled by removing the authentication config file specified above. We recommend creating an additional "cluster" user, other than the one used to install and configure Cluster Manager. This is a basic security precaution, due to the fact that the user SSHing into this server has unfettered access to every server connected to cluster manager. By using a separate user, which will still be able to connect to localhost:5000, an administrator can give an operator limited access to a server, while still being able to take full control of Cluster Manager. Next, move on to deploy the Gluu cluster.